Napa Valley is one of my all time favorite destinations in the U.S. I went out there a couple of years ago with one of my best friends and had an amazing time, but swore to myself that the next time I go it will definitely have to be with my husband. Napa is just so romantic. 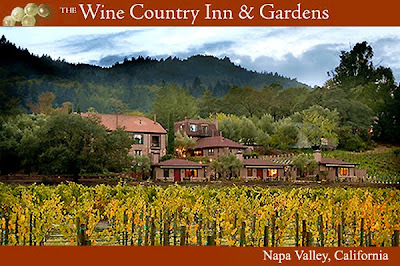 So when we do book our trip, the place where I want us to stay is The Wine Country Inn & Gardens. The Wine Country Inn has been around since 1975 and is family owned and operated...I just love that because you always get the warmth and attention you deserve when you stay at a place like this. The inn is built well off the highway and is surrounded by vineyards. They have a pool, jacuzzi, spa, complimentary breakfast & afternoon appetizers as well as a free restaurant shuttle to take you into town so that you can relax, drink wine and not have to worry about driving. Rooms range from $250-$600 a night, depending on which room you choose and what time of year you jet set to Napa valley. October: There are still many days in the 80's & 90's temperature-wise...so take your bathing suit and enjoy the Napa Valley grape harvest while you're there. November: The Inn holds its annual Ode to Olive celebration (November 19th-22nd) where you can taste different olives, olive oils and cheeses. December: Head there for a romantic New Year's Eve celebration with your honey. They have a special dinner for $75 per person which includes a four-course meal with wine right at the inn...and also a complimentary champagne toast at midnight. Labels: California, December, jetsetsmart.com, jetsetsmartblog.com, Napa Valley, November, October, The Wine Country Inn and Gardens, U.S.